I am in Burnaby, BC, for the Canadian Track National Championships right now. This is my 2nd time at Nationals as an Elite rider. 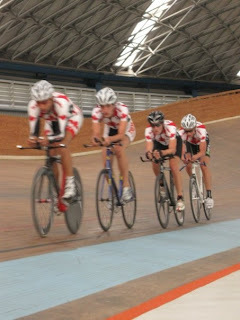 For the 3 days leading up to Nationals, I took part in a National Team camp that was all about team pursuit. We practiced starts, flying kilos and the like. We figured out teams for nationals, and I will be riding with Matt Potma, Mike Sidic, and Zach Bell. As for today's racing... it didn't go so well. My plan was to start off at 14.5 second laps, and gradually bring it down to 14.0 s laps, depending on my legs. The person who road opposite me decided to ride 13.5 s laps to start, and end up at 15.0 s. Unfortunately, this meant that he passed over me at about 13 laps to go, and proceeded to slow down right in front of me. I was stuck behind him, knowing that if I were to pass him again, I would be DQed. I couldn't allow myself to just take a time of 5 minutes, almost last place pursuit. I ended up passing him, just to see what kind of time I could do. I ended up getting a time of 4:52, but a result of "Relegated". Hopefully the rest of the week goes a bit better. I am in Trexlertown for the second time this season. I have been here for a week now, and training has been going very well. 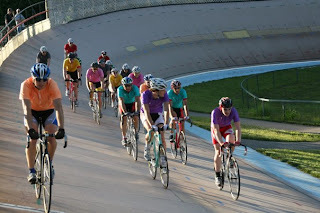 The first race night consisted of a 10 km points race, a 10 lap scratch race, and a 5 mile scratch race. My best result came in the final scratch race, coming 3rd place after almost lapping the field. Since Friday, I have been motor pacing twice, with a lot of other riding on the track and road. 3 Quebecors came down today, and two more Ontario riders should arrive tonight, so we will have a big Canadian contingent for racing tomorrow. Tomorrow's racing includes Keirins, a miss-and-out, and two scratch races. This has been quite the experience. A few days after arriving, I went out for a two hour road ride with two Mexicans, one Aruban, and one other Canadian. Since it takes over an hour to get out of the city, we were stuck on the chaotic roads of Mexico City. Though terrifying, it was a great way to see the city. 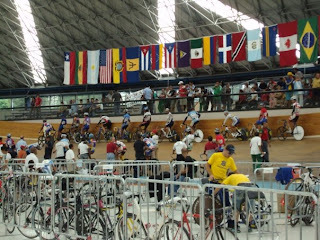 After that road ride, all riding was done on the velodrome, rollers, or on the Indy car track next to the velodrome. 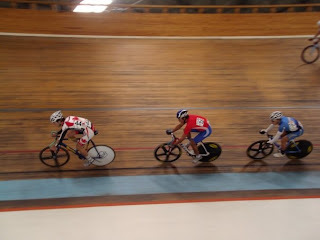 I ended up only racing the scratch race, which took place on August 27th. This was a 15km, 40 lap race. With some good advice from team mates, I ended up off the front in almost every break, but spending very little energy. Unfortunately, none of the breaks stuck. With about four laps to go, I found myself at the back of the pack. The next two laps were spent throwing elbows to move up in the pack. With two laps to go, I found myself on the very front of the pack. Not being able to maintain such a fast pace, 13 riders came over me, putting me in 14th position overall out of 24 starters. David Boily, the other Canadian ended up in 5th place with an awesome sprint to finish the race. Next racing should be T-town again on August 7th and 14th. Asi, como usted puede haber adivinado, la noche del viernes compite en Trexlertown fue llovido fuere. As you may have figured out, the big race night in T-town was rained out. Now I am in Mexico City with Team Canada preparing for the Pan American Championships which start tomorrow. I will be racing in the scratch race, on the 27th, and the team pursuit final, on the 28th. Every trip has to have a mishap, and this one had a big one. Just one day before leaving for Mexico, a crack in my seat tube opened up through the integrated seat collar. Now I am on a purple bike that is way to big for me, but we are making it work. This track is at over 2000m, and is rock hard, so it is FAST. We are almost fully adjusted to the altitude, and are hoping for a very fast time in the team pursuit on Tuesday. This is the largest team Canada has sent to Pan-Ams in a long time, and with 3 medals already on the road, this is going to be a good year for Canada. Days two and three had almost identical schedules to the first day. Day two started off well, with Daniele and I each winning our respective scratch race. Nothing eventful occurred until the final Madison, where Team USA latched onto Team Mountain Khaki as they took a lap. I didn't have the reaction to get onto that move, and the rest of the field wasn't about to help us out. Going into day 3, we would be in third place. On day three, Daniele and I knew that the only way to regain second place would be to get a lap back on Team USA, and completely forget about points. We kept the pressure on the entire time, with Daniele launching attack after attack. These efforts were futile, as Team USA stayed on us every time. We ended up in third overall. I was pretty disappointed, but it was definitely a good learning experience, and it only made me stronger. I am now in Trexlertown Pennsylvania living the life of a pro. All I do is ride, eat, sleep, and lay by the pool. The main event is tomorrow night. I will be competing in a 2 mile scratch race, a 25 lap (x 333m) points race, and a 5 mile scratch race. They are expecting 15 countries to be represented. Day One of the 3-day had a rough start. With a total of 9 teams (from Colorado, California, Pennsylvania, Michigan, Texas and of course Ontario), I had a hard time finding my legs for the first few races. The races are being run by UIV rules, which means everyone has an 88" gear restriction (49x15). The first event was a flying 200m, where I placed 5th out of 18, with a time of 12.08s. After that came a one mile scratch race for each team member. Daniele placed 2nd in his, and I was 3rd. The first Madison was 60 laps, and my legs felt like dirt. I found myself on the back of the pack, feeling like I was in a 70" gear. I couldn't figure out what happened to me. The miss-and-out came next with points going to the top 10 riders. I just missed out on points getting boxed in. Daniele ended up in 2nd getting pipped at the line by Team USA. The last event of the night was a 100 lap Madison, where I finally found my legs. I was finally able to launch and chase down attacks, instead of barely holding onto the back. We won a few of the intermediate sprints, but most importantly, we won the last sprint for double points. Daniele and I are now in 2nd place, only 8 points down from first. ps. Hit 108.3km/h behind the motor on Tuesday! I spent last Friday in Bloomer Park, Rochester Hills, Michigan. In the afternoon, a few of us did some team-pursuit training. In the evening, racing started. There was a Canadian invasion with 4 teams coming from FCV, and I was partnered with Jason King, of Oakville. This was the third of their Friday night Madison series. 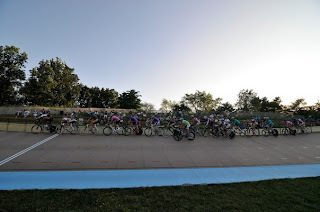 The racing started with a one-mile scratch race for each partner, then a 50 lap Madison, then a miss-and-out with everyone, and finally a 100 lap Madison. Jason King did the first scratch race, attacking a bit too early and getting swallowed up by the pack with about half of a lap to go. I won my scratch with an attack over the top with one lap to go. In the Madison, we played it conservatively, and that didn't pay off. Team Euro (Daniele DeFranceschi, Windsor, and Nick Console, Rochester, MI) took a lap. In the miss-and-out, I was eliminated early when I got boxed in the sprinter's lane. Jason King, however, raced extremely well and came second to Daniele. Going into the final Madison, we were in a solid second place. We ended up going for all the sprints, knowing that team Euro wasn't going to let us take a lap. Final standings had us in second place with 88 points and Team Euro in first place with 99 points. My next big race is the International 3-Day (http://www.nas-track.com/velodrome/pages/vabp-raceevents.htm#nt3day) in Bloomer, where I will be racing with Daniele. Good luck to Trek-Store riders at CHIN tomorrow, and happy Canada Day!